We are one of the re-putative manufacturer & exporter of CNC Quills Liners. Our product range also comprises of Wire Drawing Dies, Industrial Collet and Diamond Powder Paste. 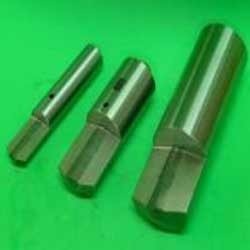 We manufacture carbide CNC Quills Liners used in CNC spring making machines. These quills give very good life and are made as per client's required samples. The application area includes construction, automobile and hardware industries. Sometime our product is used in the furniture design and interior design industries. These liners undergo various quality tests to ensure superior performance level. They are known for their dimensional accuracy and design. Our product is available in different sizes and can also be customized according to the requirement of the clients. Looking for CNC Quills Liners ?